Brazil is the scene of record breaking rallies with over 1mn people across 100 cities demonstrating their discontent with the government. Two people have been killed in the protests and dozens injured, despite reforms promised by the country’s president. 12:30 GMT: Over a quarter of a million people took to the streets across Brazil to protest government corruption. A new poll shows that 75 per cent of Brazilians support the demonstrations. 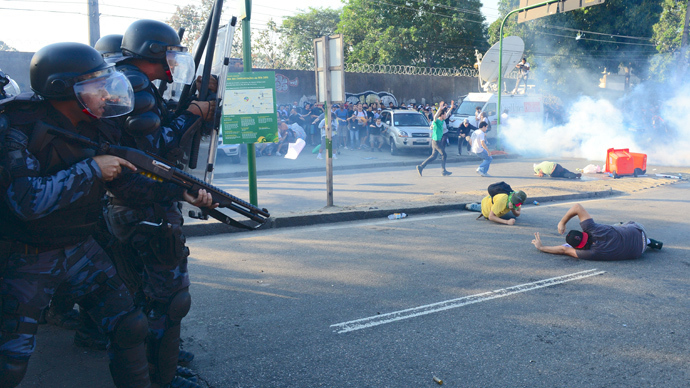 In the cities of Belo Horizonte and Salvador the protests turned violent as activists clashed with police. The vast majority of the demonstrations, however, have been peaceful. 00:50 GMT: Five people arrested in Belo Horizonte during the rally that blocked off streets in the city as rioters looted the center. Several shops were vandalized and signposts and traffic lights damaged. Police moved in to stop the unrest. 00:25 GMT: So far protests have been held in 107 cities across the country with 286,600 people taking part in demonstrations, according to police estimates. 00:13 GMT: About 3,000 people are rallying in front the National Congress in Brasilia demanding the resignation of several MPs. 23:16 GMT: A group of protesters peacefully rally in front of the governor’s house in Rio de Janeiro, demanding better public services. The area remains calm and protesters are even offering food to the policemen guarding the property. 23:07 GMT: Police estimate that at least 35,000 people have taken part in a number of marches all across Sao Paolo on Saturday. 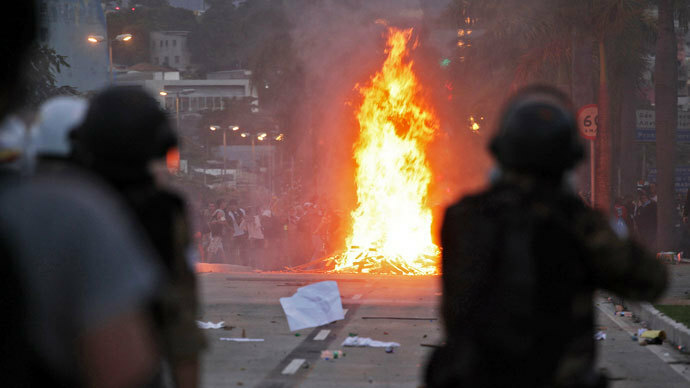 22:46 GMT: Fifteen people have been injured in clashes in Belo Horizonte, police spokesman Colonel Márcio Santana said. Four of those injured were police officers. Authorities were not using excessive force, the spokesman stressed, explaining that there was a group of provocateurs among the crowd while the majority of protesters were rallying peacefully. He has called on protesters to reunite with their families and go home peacefully. 22:21 GMT: A major shopping mall Iguatemi has closed its doors in Salvador with clashes taking place right in front of it. Meanwhile at least six bus stops have been vandalized across Bahia state. 22:05 GMT: A video allegedly showing the moment police used tear gas against the crowd near the Pampulha Airport in Belo Horizonte after a group of protesters tried to breach police cordon. 22:01 GMT: Police in Belo Horizonte have used rubber bullets to disperse a crowd of violent protesters at the front of the march. After the rioters fled, a representative of the military police force reportedly addressed the remaining crowd of peaceful protesters. 21:40 GMT: Firefighters have been deployed to an area near the Pampulha Airport in Belo Horizonte, where protesters have set at least one vehicle on fire. 21:21 GMT: Mounted police deployed to the scene of clashes in Belo Horizonte are trying to disperse protesters, Globo reports. 21:16 GMT: A protester has fallen from the overpass over Abraão Caram avenue in Belo Horizonte reportedly suffering numerous fractures. 21:03 GMT: The situation is reportedly getting out of control in Belo Horizonte, Globo reporter says. Protesters are setting fires and clashing with police. At least three demonstrators and four protesters have been injured so far. The Risoleta Neves hospital confirmed receiving a young woman with a head injury. 20:54 GMT: A march has been dispersed in Vale dos Barris avenue in Salvador. At least three people have been arrested for misbehavior, including public urination, confrontation with police and an attempt to break into a store, Globo reports. 20:29 GMT: At least 4,000 demonstrators are marching peacefully in the center of Sao Paulo, according to police estimates. 20:14 GMT: Military police have dispersed a group of violent rock throwing protesters near the Mineirinho Arena in Belo Horizonte. The situation seems under control as the vast majority of the 65,000 protesters rally peacefully, Globo reports. There were no reports of injuries among the protesters, but one police officer has reportedly suffered an eye injury. 19:42 GMT: Some 5000 protesters gathered 5 killomers away from the stadium in the northeastern city of Salvador, where the national football squad played Italy in a match for the Confederations Cup. The crowd demanded better schools and transportation and criticized spending on next year's World Cup. 19:14 GMT: Up to 20,000 protesters in Belo Horizonte are marching to the stadium where the game between Japan and Mexico is being hosted. 19:05 GMT: Some 30,000 people protested in the streets of the town of Santa Maria, in the southern Brazilian state of Rio Grande do Sul. 18:31 GMT: New rallies kick off in Sao Paulo and 60 other cities across Brazil, reports RT en Espanol. 16:26 GMT: The Brazilian Government has called in the military to help police monitor and ensure safety in tonight’s game with Italy in Salvador de Bahia as protests continue to spread. Brazilian President Dilma Rousseff tried to calm the protests via a televised address, promising new plans for public transport, the health care system and pumping oil royalties into education. 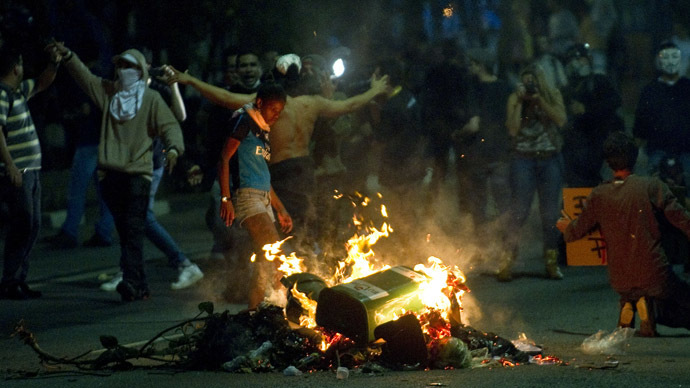 23:57 GMT: Unconfirmed reports of looting on the outskirts of Sao Paulo. 23:22 GMT: Protesters have reportedly blocked eight roads in Sao Paulo. 23:10 GMT: Thousands of people have taken to the streets in the city of Guarulhos, Sao Paulo state. Protesters are calling for a peaceful rally and urge to avoid any violence. 22:35 GMT: FIFA confirms that the 2014 World Cup is not at risk, as protesters continue to reject the championship. 22:30 GMT: In several Brazilian cities some violent groups were reportedly looting shops and causing havoc during the new round of mass protests. 02:30 GMT: Now that the trigger event, the hike in prices for public transportation, have been reversed, RT spoke with Brazilian journalist Mauricio Saverese. “Transport fares were pretty much tackled on Wednesday. Now that the main issue is resolved, most people are now doing some soul searching, wondering whether they should join the next protests,” says Saverese, adding that increased violence could also turn off mass participation. “It is not exactly about the economy, because Brazil is living through pretty much full employment. It’s not doing that terribly compared to European countries ... To me, it’s a beginning of a struggle for a bigger role of the middle class in Brazil’s political life,” he adds. 17.00 GMT: Cleonice Vieira de Moraes, 54 who was hospitalized over tear gas inhalation during a protest on Thursday has died in hospital. 10:52 GMT: FIFA says it has no intention of cancelling the Confederations Cup in Brazil because of the mass protests. Previously, the Brazilian press had reported that some teams, including the Italians, were considering withdrawing from the tournament. 05:36 GMT: Brazilian President Dilma Rousseff called an emergency Cabinet meeting Friday morning following a day of mass protests across the country. She was also forced to cancel a trip to Japan planned for next week. 02:03 GMT: 41 injured people have been admitted to Souza Aguiar hospital in Rio de Janeiro following clashes, hospital officials say. 01:10 GMT: One person has been killed and three more injured after they were hit by a car in the town of Ribeirao Preto, Sao Paulo state. Witnesses say that the car tried to break a human chain created by protesters. Apparently outraged because he was being blocked, the driver accelerated the vehicle and ran over the four. 00:23 GMT: Protesters in the city of Fortaleza broke through a police line and entered the Palace of Abolition, the seat of government of Ceará state. Authorities in Brazil's cultural capital expect as many as a million protesters to converge on the city, despite recent announcements by state governments to scrap plans to increase public transportation costs. Protesters intended to march on Maracana Stadium just as a Confederations cup football game was to kick off. 19:36 GMT: Rio de Janeiro authorities have ramped up police strength with an estimated 8,000 officers to be deployed to handle the demonstration the city’s center and security for the Spanish and Tahiti football teams. Some 1,200 riot police, armed with teargas and rubber bullets, will remain in barracks unless the protest turns violent. The increase comes after the authorities admitted they underestimated the scale of Monday's march, when only 150 officers were on duty to withstand a crowd of more than 100,000. 15:00 GMT: Leaders in two of Brazil's largest cities reversed hikes in bus and subway fares that fueled the protests. Sao Paulo and Rio de Janeiro both stepped down. "This will represent a big sacrifice and we will have to reduce investments in other areas," said the Mayor of Sao Paulo, Mayor Fernando Haddad. However, protests are still planned for Thursday in both cities. Protest organizers have called for demonstrations as people continue to express discontent with broader-scale corruption. Their frustrations are intensified by high taxes and poor public services. 12:05 GMT: Brazilian football legend Pele has called upon the protesters to leave the streets and focus on football, as Brazil is currently hosting the Confederations Cup, the country’s main tournament before next year’s FIFA World Cup. "Let's forget all this commotion happening in Brazil, all these protests, and let's remember how the Brazilian squad is our country and our blood," Pele was quoted as saying by TV network O Globo. Social media users were less than thrilled by the comments, with many suggesting that the wealthy sporting great simply has no idea how ordinary Brazilians live. 00:30 GMT: In a video posted online, an on-duty riot police officer is described by Brazilian television as having been dismissed from his post by a superior after refusing to comply with orders. The superior is clearly agitated after the second officer hesitates after being asked to use a police vehicle to block protesters’ path, and he removes his weapon and dismisses him. 22:30 GMT: A video of Brazilian police officers sitting down with demonstrators in Sao Paulo during the mass protest earlier this week has gone viral. 21:25 GMT: The cities of Sao Paulo and Rio de Janeiro are to roll back transport fare hikes in response to the widespread demonstrations, according to officials cited both by AFP and Reuters. The day prior several smaller municipalities had made similar announcements, though today’s news is significant as Sao Paulo is the country’s largest city, with some eleven million residents. Together with Rio, it had been the focal point the mass protests this week and last week. Starting next Monday, fares for metro, train and buses will be reverted back to $1.50 from $1.60, says Sao Paulo State Governor Geraldo Alckmin. In Rio, bus fares will go back to $1.37 from the recently announced $1.47, according to mayor Eduardo Paes. 19:30 GMT: Hackers replaced a Brazil World Cup Website (http://copaemcuiaba.com.br) with a popular Youtube video that urges people not to come to the country to watch the World Cup, as well as a montage of alleged police brutality at the protests. The unknown hackers also edited the title of the website with “Nao Venha Pata a Copa No Brasil. Do not come to Brasil for the world cup.” That is a sentiment that has made its way onto signs and chants used by demonstrators throughout Brazil, who see the link between the vast sums spent on preparations for the World Cup and the inability of the state to provide better social benefits as a symptom of corruption. 16:48 GMT: At least two demonstrators are reported to be injured in clashes with police near the stadium in the Brazilian city of Fortaleza on Wednesday. At least 30,000 protesters threw stones at security forces, who responded with tear gas and rubber bullets. One person suffered an eye injury and another was taken away on a stretcher. The protesters were marching against government spending on the World Cup and the Olympics. Brazil was to play a Confederations Cup match with Mexico later in the stadium, which went on as scheduled after protests were dispersed. During the protest at Fortaleza demonstrators carried banners reading "a teacher is worth more than Neymar," a reference to one of Brazil's star players slated to appear in Wednesday’s game. 06:50 GMT: The Brazilian government to deploy National Public Security Force in five cities hosting the FIFA football tournament in an effort to contain the ongoing protests across the country. 05:01 GMT: Hundreds of Brazilians living in Canada took to the streets on Tuesday in Vancouver to show their support for the wave of protests in Brazil. 04:52 GMT: Brazilian President Dilma Rousseff tries to defuse tensions in a televised speech by praising the protesters, saying that the demonstrations were legitimate and that the government was committed to social change. 02:50 GMT: Sao Paulo continued to be the focal point of protests on Tuesday night, with smaller demonstrations seen in the thousands in Rio de Janeiro as well as Belo Horizonte and smaller cities around the country. In the country’s largest city there were reports of looting and vandalism inflicted on several bank branches. Local media meanwhile had sporadic reports of individuals in Sao Paulo hauling electronics and home appliances out of shattered store fronts, as well as stealing watches, jewelry and mobile phones. Aside from a tense moment when demonstrators attempted to breach city hall, however, the situation seemed more subdued than the day prior. Some fifty individuals were reportedly arrested in that city while police continued to comb through downtown. 01:30 GMT: Police are attempting to disperse tens of thousands of protesters converged on Avenida Paulista, the main drag in Sao Paulo, using tear gas. In Rio, 7,500 members of the armed forces are on standby to be deployed if the protests cannot be contained. 23:20 GMT: Minas Gerais governor Antonio Anastasia requested the support of Brazil’s National Security Force (national guard) to help contain ongoing protests in the regional capital of Belo Horizonte. According to a spokesperson, 150 federal police had arrived to the city. The city, like many others throughout Brazil, is in its third day of demonstrations. On Monday, military police fired tear gas and rubber bullets as protesters attempted to break a blockade. 23:00 GMT: There have been reports of some property damage. Demonstrators attacked a Banco Itaú branch and destroyed several ATM machines, though there was no indication of looting, according to Folha de S.Paulo. There were other reports of stores being vandalized, though they appeared to be isolated events. 21:50 GMT: In response to protests, several municipalities in Brazil have announced plans to lower public transportation fares. The cities of Porto Alegre, Cuiaba, Recife and Joao Pessoa all say they will reduce bus fare by 2 cents to 5 cents. Meanwhile, the mayor of Sao Paulo, Fernando Haddad, said he might also be willing to consider such a reduction. 21:35 GMT: In an address from the presidential palace on Tuesday, president Rousseff expressed sympathy with the demonstrators. "These voices need to be heard," Rousseff said. "My government is listening to these voices for change. My government is committed to social transformation," she added. 21:10 GMT: Demonstrators have completely overtaken Avenida Paulista, one of São Paulo's major arteries. Municipal police reportedly used pepper spray to thwart a smaller subset described as "radical" which tried to storm city hall. Other groups of demonstrators reportedly chanted for peaceful protest and against any vandalism (lower video). 20:02 GMT: Some ten thousand demonstrators are already gathered in downtown São Paulo, with a large portion of the group marching towards city hall. No major clashes have so far been reported and the crowd appeared peaceful despite large numbers. 13:02 GMT: The demonstrations were initially triggered by a 10-cent hike in bus fare, bringing the price to the equivalent of $1.60, and fueled by 6.5 percent inflation, as well as other economic problems. Afterwards, the people started taking to the streets to protest against government corruption and income inequality, as well as in outrage over the police’s harsh response to protesters last week. 12:40 GMT: Military Police (MP) in Sao Paulo are keeping a close watch on the area occupied by the protesters. 12:32 GMT: About 50 protesters spent the early hours of Tuesday in front of Bandeirantes Palace, where the government of Sao Paulo is headquartered. The Palace is situated in Morumbi, in the south of the state capital. The situation remained tense throughout the night. 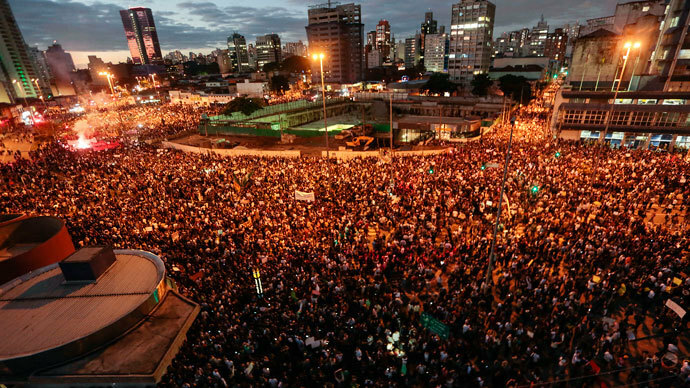 02:00 GMT Central Sao Paulo was filled with protesters last night. Here, a resident captures the bustling scene on video.